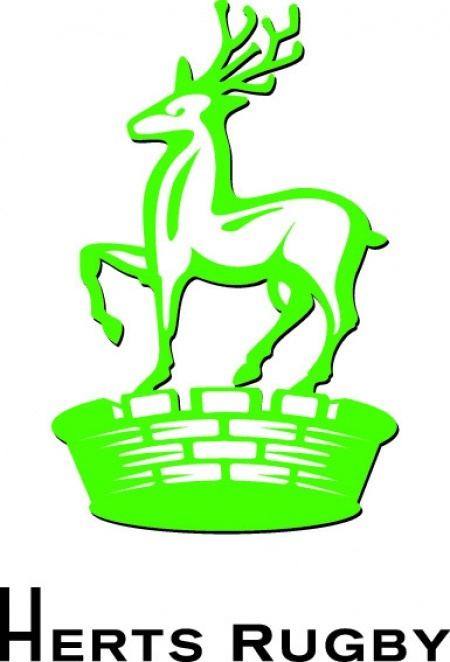 Hertfordshire demolished Kent scoring 5 tries in the last quarter of their opening match in the Bill Beaumont County Championship at Cheshunt on Saturday. Although Herts had led at half time an early second half converted try by Kent had closed to gap to 3 points at 24 – 21 and the game was in the balance. However, as the hot weather and fast pitch took its toll Herts had the greater strength in depth and their replacements had a telling impact on the game with three of the late tries coming from them. This was the first time that Hertfordshire had played a County Championship match on an artificial surface match and Cheshunt RFC’s new AGP combined with hot day proved ideal for a fast, open game. As usual in the first Championship of the season both sides took time to gel. Hertfordshire’s set piece play was a little uncertain early on with Kent troubling them in the scrums and some of the lines out going awry. But as the game went on everything came together with the resulting points deluge in the last quarter. Herts had an early chance to open the scoring when Kent were off side on their 22 but Herts elected to kick for touch, where they lost the line out. Undeterred when next awarded a kickable penalty after some 14 minutes play they again elected to kick for touch. This time they drove from the line out and prop Will Roberts touched down for the opening score. Minutes later Kent took the lead when wing Lloyd (Blackheath) broke through a tackle to touch down for a try that Reynolds (Tunbridge Wells) converted. The lead was very short lived as from the restart as the home side ran the ball, centre Richard Streets made the break to put skipper Tom Banks over under the posts. Sean Tayler converted to make it 12 – 7 to the home side. On the half hour Herts extended their lead when lock Sam Lunnon picked up a loose ball on the Kent 22 and had a clear path to the line. Taylor’s extra two point took the home score to 19. With Kent still having the edge in the scrums they were soon back on the attack. The move from a No 8 pick up at a 5metre scrum was forced into touch, but at the next 5mtere scrum No 8 Catt (Blackheath) drove over for a try converted by Reynolds. Herts had a sticky start to the second half losing a line out against the throw and then conceding a penalty and losing centre Rea to the sun bin. Kent tool their chance winning good loose ball and scrum half Smart (Canterbury) touched down, Reynold’s conversion then reduced the gap to just 3 points. Kent continued to exert pressure and game appeared in the balance. Then Herts used their replacements judiciously. Rea did not return and was replaced by Luke Barber, who had a big hand to play later. With 20 minutes left Herts set up a line out near the Kent line and flanker Sam Lunnon drove over. Before the restart Ben Creasey replaced Banks and with almost his first touch of the ball, sprinted over the line from 20 metres after the forwards had won turnover ball. Taylor converted both these tries to set Herts firmly in control at 38 – 21. Within minutes replacement Barber was on hand to finish the move after Taylor had made a fine break. The floodgates were now open and there was time for the home side to score another two tries. Firstly, the forwards set up Conquest for his second try and then Barber completed his brace following a break from No 8 Chris West. With Taylor adding the extras each time the final tally was 59-21 to Herts. Nest week Hertfordshire travel to Lydney to take on Gloucestershire, who also had a bonus point victory. The other significant result in the group was the 15 all draw between Cornwall and Surrey, which leave the group wide open. Rob Conquest (Cambridge), Harry Green (Tring), Sam Lunnon (Old Albanians), Nick Radley (Tring), Chris West (Old Albanian). Hertfordshire: Tries – Roberts (15m), Banks (20m), Conquest (27m, 74m), Barnes (40m), Lunnon (61m), Creasey (63m), Barber (68m, 76m); Conversions – Taylor (20m, 27m, 61m, 63m, 68m, 74m, 76m). Kent: Tries – Lloyd (18m), Catt (31m), Smart (48m); Conversions – Reynolds (18m, 31m, 48m).